Ironically many people find themselves in the autumn and winter months with some additional spare time, in these months however but we seem to be at our busiest. With work and various life matters being flat out there seems to be no end in sight of places to go, thing to buy and people to see. Still, being the opportunist angler that I am, meant despite travelling home I was able to arrange a few hours on the fly with my Dad and Grandfather. We would be heading down to Riverside for a few hours to try and tempt some last gasp puddle pigs that resided there before the seasons really took a turn for the worst. Instead of using a conventional floating deer hair fly I would be using a 8mm fake dog biscuit on a 5 ft Guru N-Gauge leader. Any bigger than 8mm and the weight of the biscuits ruins your cast. I only had around 2 hours to fish so was keen to get the fish feeding as soon as possible and being late on in the year despite the mild temperatures I knew we may be faced with an uphill struggle. I suppose this is a real advantage of fly fishing, you can be set up and fishing in a matter of minutes. A few pouchfuls of biscuits however did not stir the surface into life as I had hoped for and with some roaming anglers to our right casting into the dog biscuits we had just fired out, it meant casting our lines was going to get a bit awkward. It also made me wonder who teach angling etiquette these days! “Thinking Tackle” has a lot to answer for! Very greedy or very ambitious! 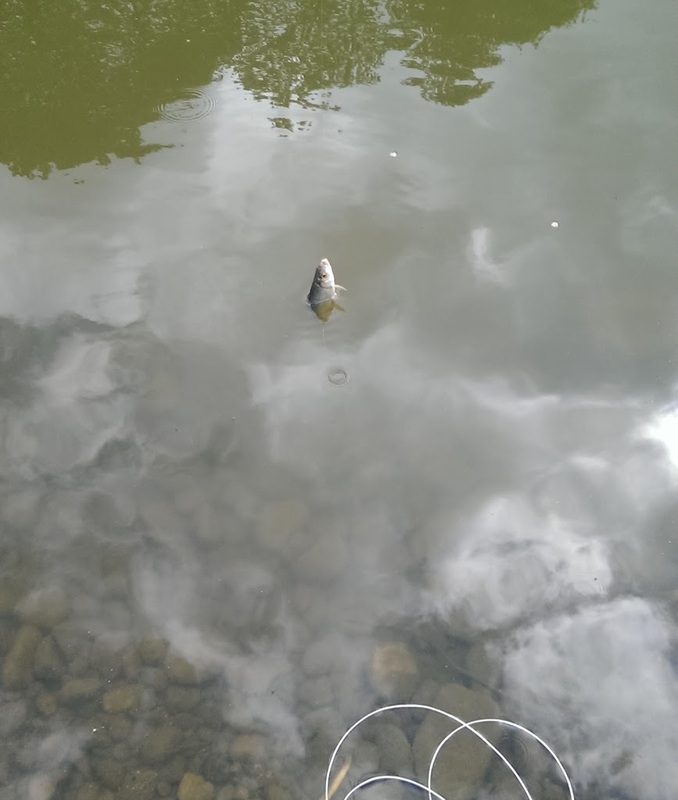 I was in to the first fish, but on striking I knew it wasn’t anything sizable, and sure enough on bringing it to the bank I found myself attached to a very ambitious Roach. I quickly unhooked it and plopped it back in. 10 minutes later and the fish started to arrive, although they seemed more curious than keen, and the ensuing feeding frenzy i expected didn’t materialise. Infact any biscuits taken off the surface were being taken very tentatively. Maybe this method had been found out? Surely not with the vast majority of teenage anglers using bubble floats and rope as the main constituents of their rigs. Maybe it was too late in the year? The first person to strike into a fish was Gramp! This wasn’t in the script! Still I was pleased to see him hook into something, especially as the fish were being particularly quiet on the feeding front. He played the fish for a few seconds before it turned and shook the hook! I don’t know who looks more chuffed! The wind was stared to turn and whip around the lake making my casting a complete nuisance, so much so that I almost caught the hat from on top of my head! I moved position and walked towards the corner of the far end of the lake. It was a lot easier to cast and I could see some bigger fish moving around the open water. Grabbing the catapult I fired out several pouchfuls of biscuits then cast my fake offering just beyond them. A mouth appeared behind my hook bait and slurped it down. I was in, and this time it wasn’t a roach! The fish streamed off and before long it was pulling line of the reel. I was only using relatively light fly fishing gear so when I couldn’t turn the fish I started to wonder how big the fish was. 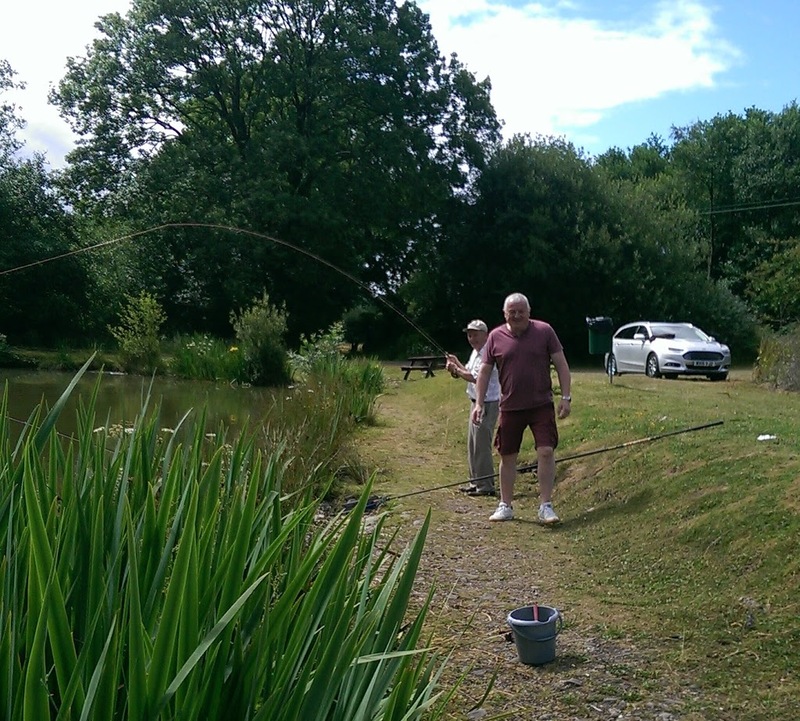 My Gramp appeared with the landing net and on the third attempt of turning the fish he got it in the net. It was bigger than I anticipated, taking the scales just shy of 11lb. Quite pleased with what was 2 hours fishing in cool and windy conditions. 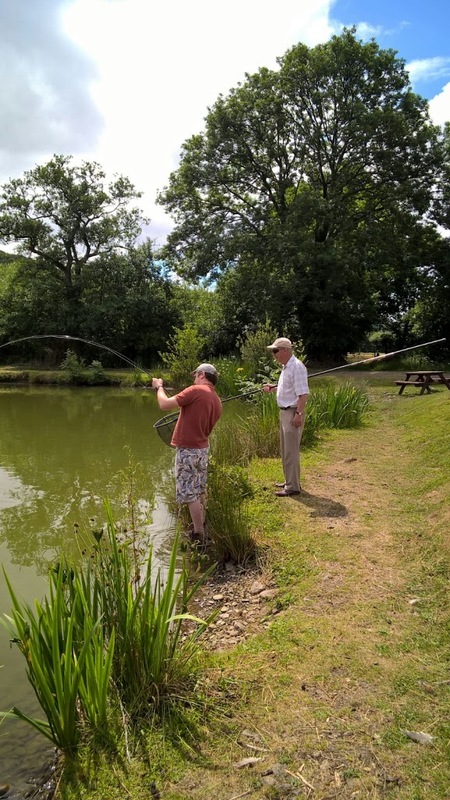 It had taken me 10 minutes to land that fish, and with that my time on the venue was up, I had other relatives I needed to see before returning home to Somerset, still it was great to get out and spend some time fishing my both my Gramp and Dad. The venue itself was producing the occasional Carp, but not prolific in comparison to what I’d normally expect despite how late on in the year it was. For a full venue review please click here. While the year winds down I will be doing some last minute Bass fishing along the south coast to see if I can actually catch one of those elusive bars of silver!